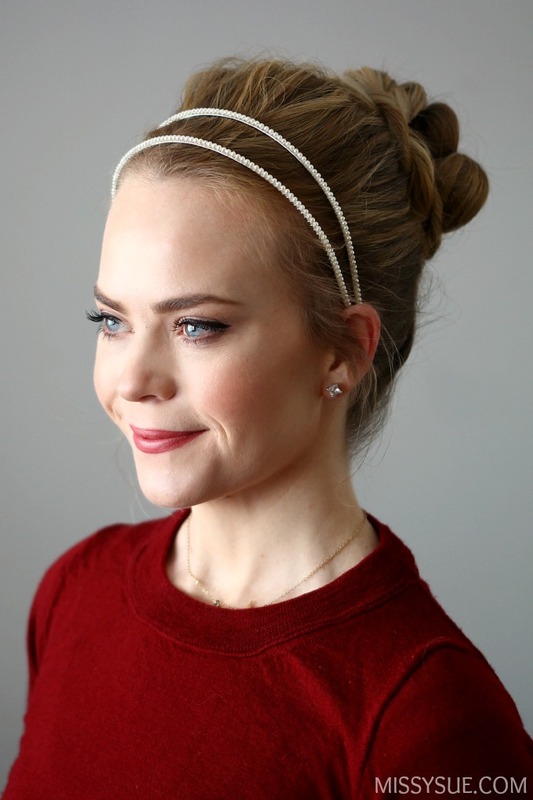 Holiday parties are such a fun excuse to wear something sparkly. 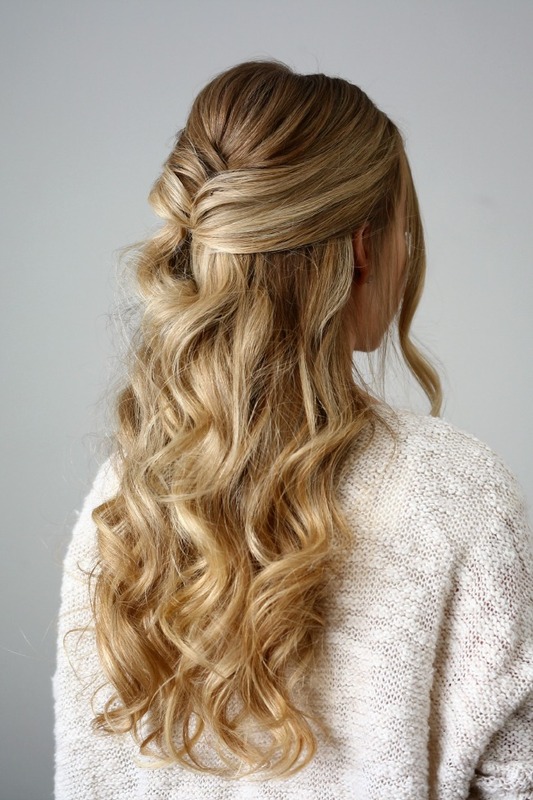 And what better time to try something new with your hair too! 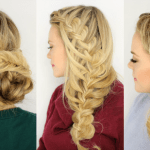 These are three easy looks that will look great at your holiday office party, New Years party or weekend get-together with friends and family. 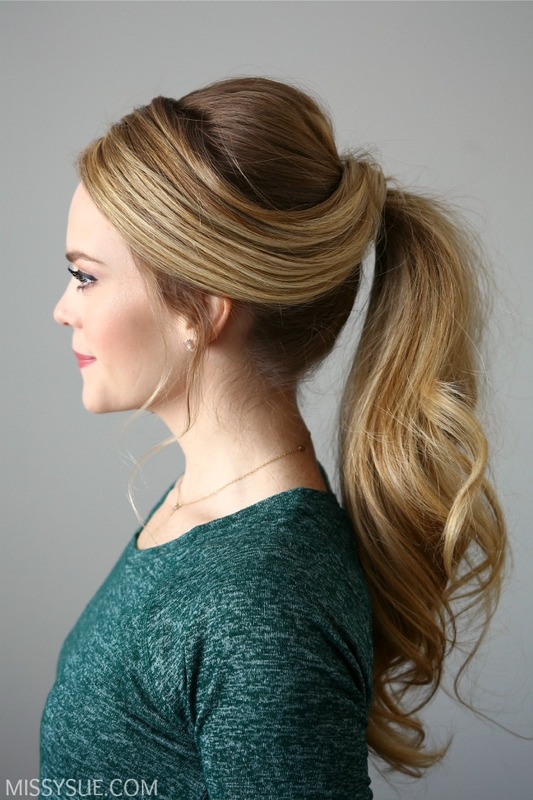 Step 1 / Brush the hair up in a high ponytail. 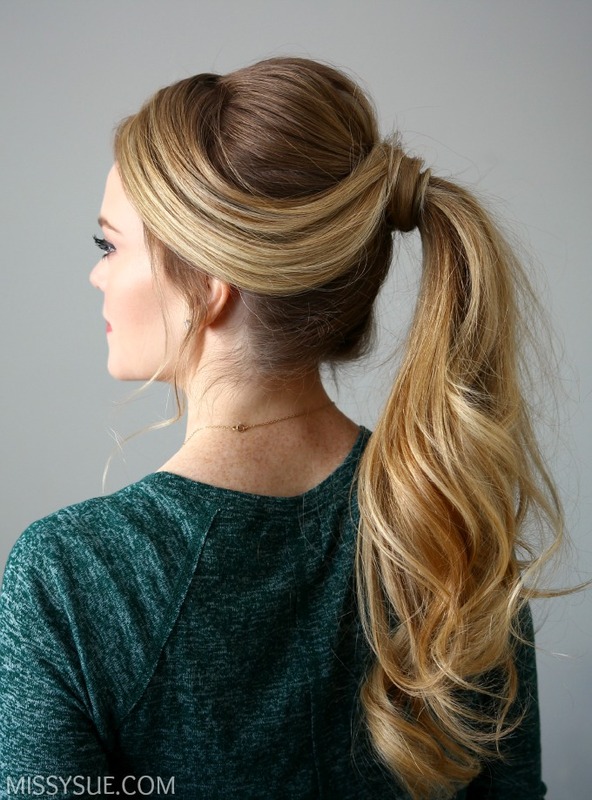 Step 2 / Wrap a mesh donut over the ponytail, so it’s going through the center. 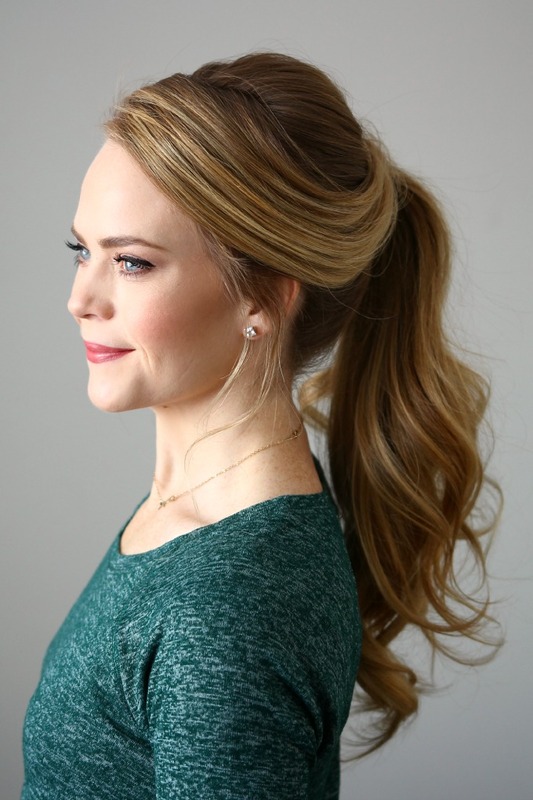 Step 3 / Divide the ponytail into three sections. 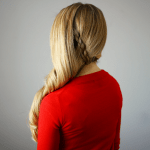 Step 4 / Braid each section into a rope braid, tying off the ends with a clear elastic band. 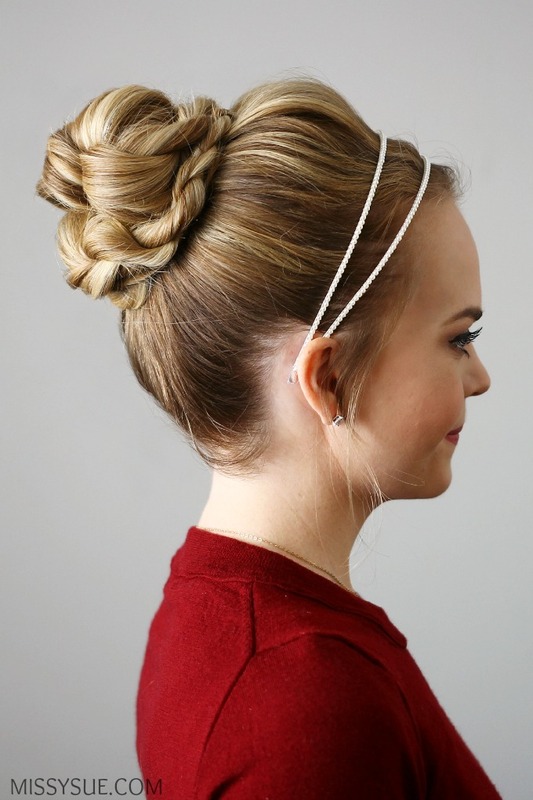 Step 5 / Wrap each rope braid, one by one, around the mesh donut, pinning the edges with bobby pins. 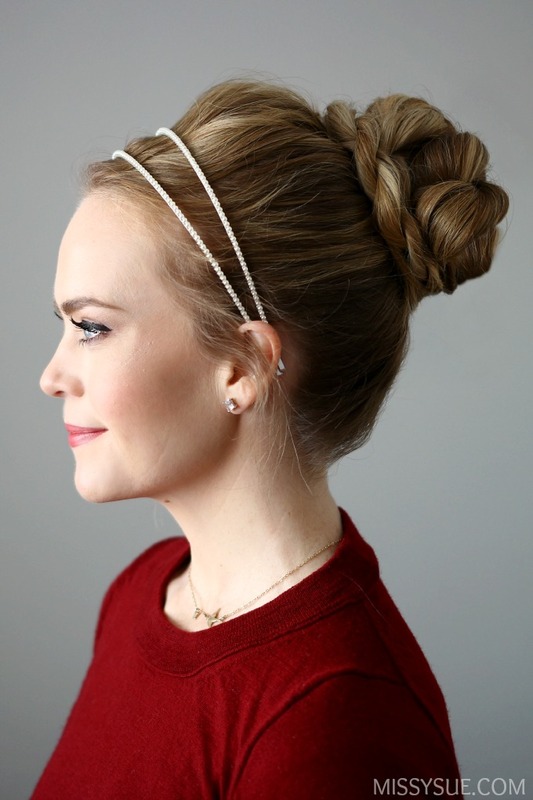 Step 6 / Spray the style with a firm-hold hairspray and add your favorite headbands. 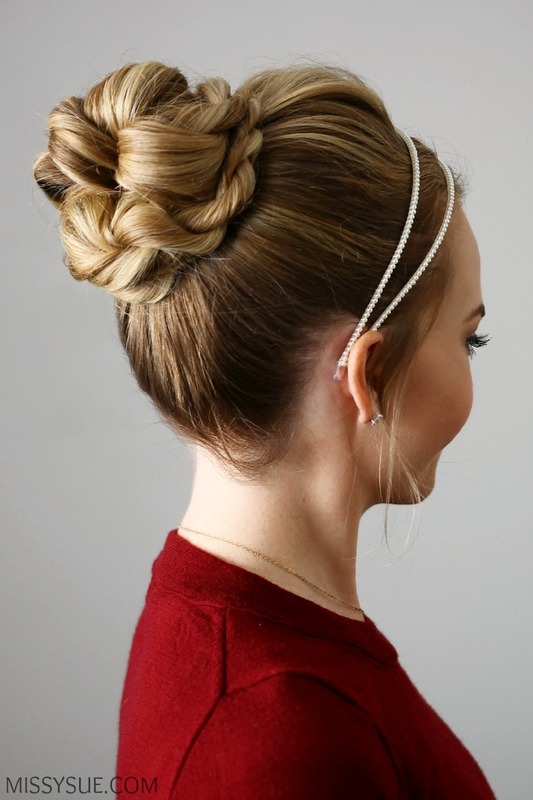 Step 1 / Part the hair in a deep side part and brush the hair at the crown towards the back of the head. Step 2 / Divide off two sections of hair from the part down to each ear, clipping off the forward portions. 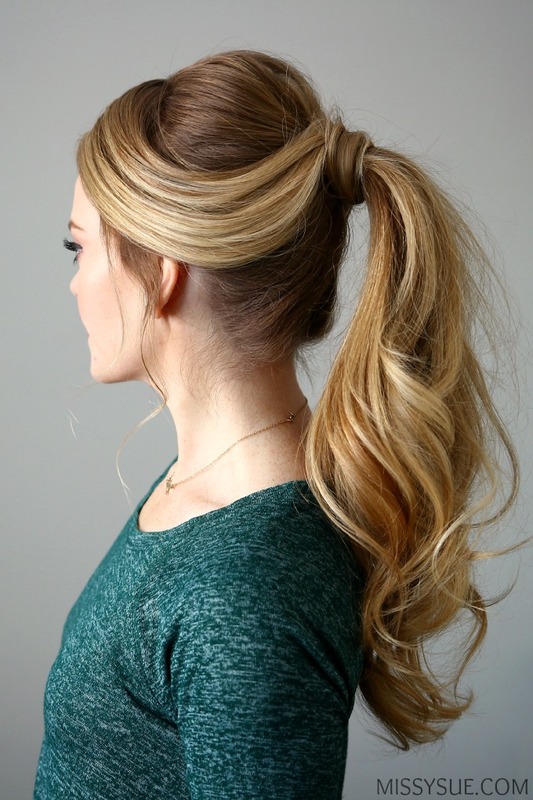 Step 3 / Sweep the hair at the back of the head into a high ponytail, tying it off with a hair band. 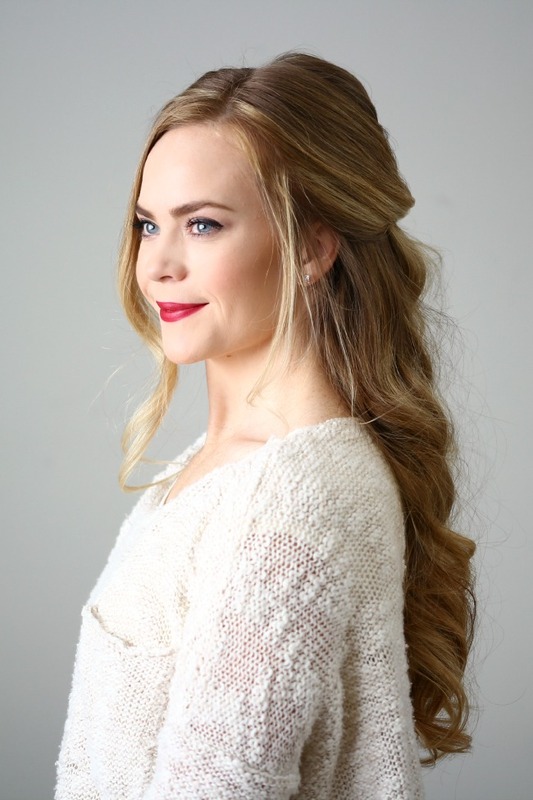 Step 4 / Let down the clipped portions and bring the left side towards the ponytail, laying it over the hair band. 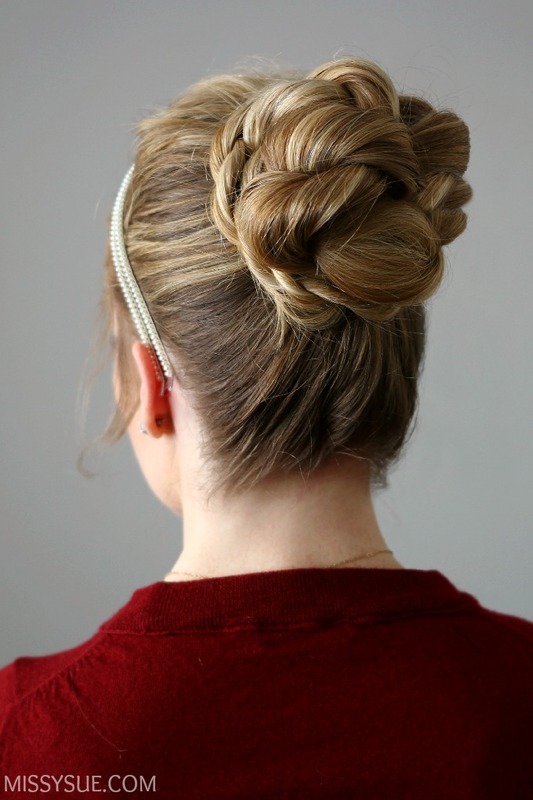 Step 5 / Wrap the hair around the band and pin down the end with bobby pins, pushing the pin into the hair under the band. Step 6 / Repeat the previous steps with the hair on the right side. 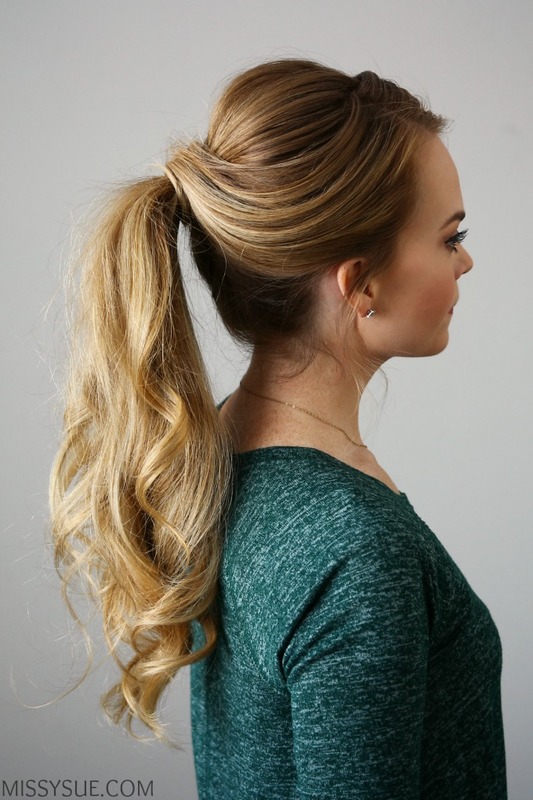 Step 7 / Curl the ends of the ponytail with a 1″ curling iron. 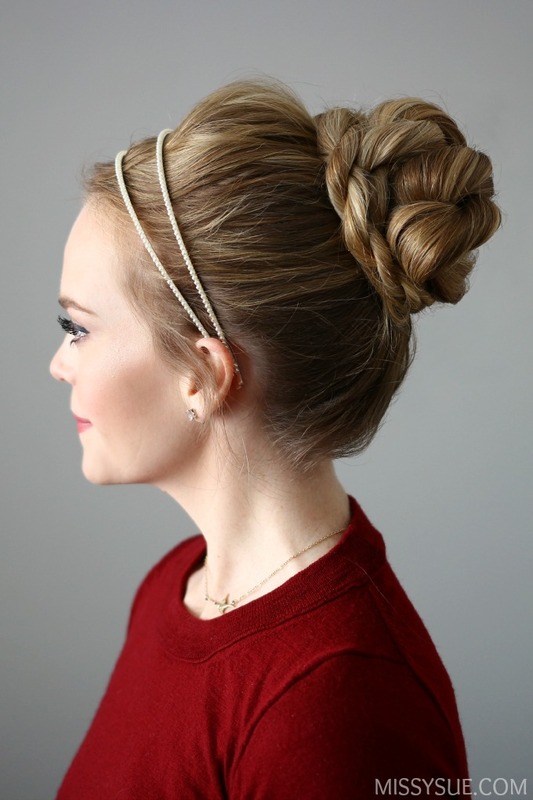 Step 8 / Set the style with a medium or firm hold hairspray. 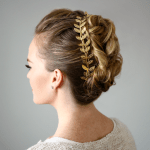 Step 1 / Divide off a section of hair at the back of the crown. Step 2 / Twist the section together, laying it against the head, and pinning it down. 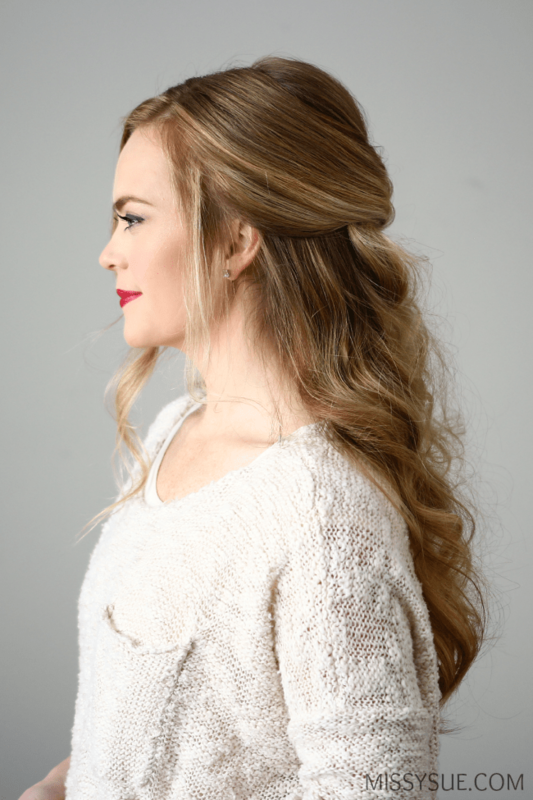 Step 3 / Pick up a 3″ vertical section of hair on the left side of the head. Step 4 / Bring the section towards the back of the head and twist it under itself, creating a half loop. Step 5 / Pin down the loop with bobby pins, hiding them underneath the loop. Step 6 / Repeat the previous steps with a section on the right side, wrapping it under itself and pinning it next to the previous section. 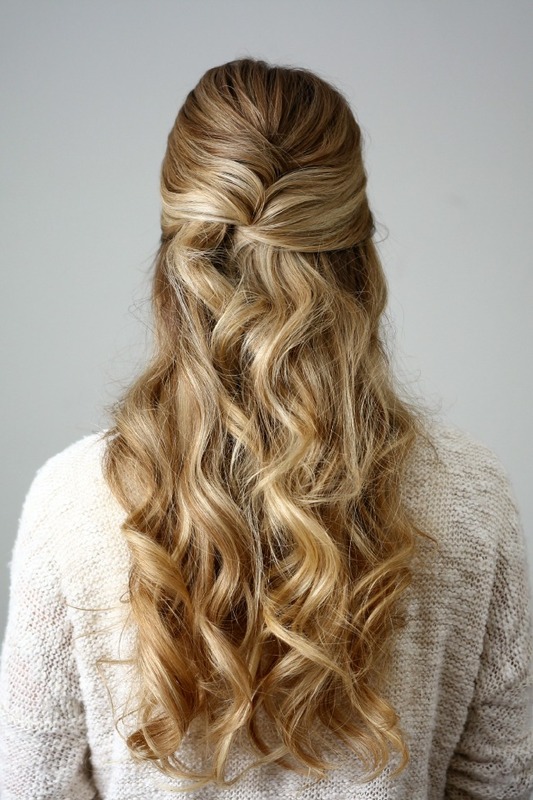 Step 7 / Curl the ends of the hair with a 1″ curling iron and set the style with a medium hold hairspray.